Losses from theft and vandalism suffered in the UK construction industry have been estimated at around £400 million a year – over £1 million each day! Providing site security and privacy, these smart screening panels are ideal enclosures in public areas such as shopping malls and airports. 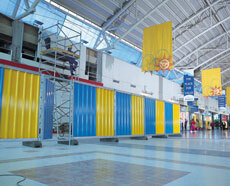 The solid galvanised panels are 2.2m wide and supplied with rubber block feet and couplers.